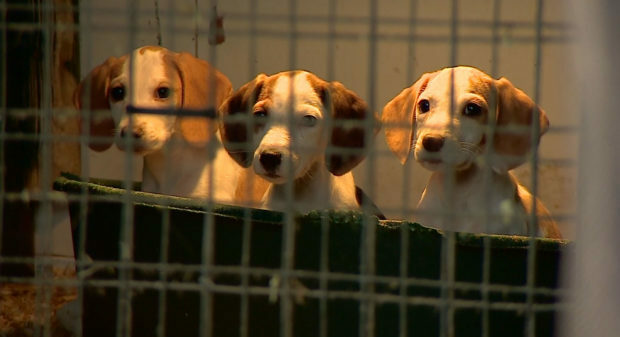 Two people involved with an alleged puppy farm in Aberdeenshire are to fight a bid to re-home nearly a hundred dogs. Around 90 animals were taken from East Mains of Ardlogie farm, near Fyvie, in November following a Scottish SPCA raid. The welfare charity is now keen to find new places for the dogs it seized to stay. The owners of the farm at centre of the investigation, Frank James and Michelle Wood, 28, appeared at Banff Sheriff Court yesterday to signal their intention to fight the SSPCA’s action. Solicitor Kevin Clancy, who is representing the charity, said he would be making an application to relocate the animals under the Animal Health and Welfare (Scotland) Act 2006 and moved for an evidential hearing. Sheriff Robert McDonald asked the defendants if they would oppose the order and was told they would do so – but were struggling to find legal representation. They appealed for more time to prepare their defence, but Sheriff McDonald said he was only willing to accept a brief delay. He told the defendants it was not his job to find them legal representation. He said: “I would not be surprised if there were someone in the north-east who can take this on, but it is not my job to make a recommendation. Mr James and Ms Wood have to submit their defence answers by Thursday April 19, with a hearing to be held the next day. Mr Clancy said a short delay would be helpful. “There may be benefit in this if we are to understand what the defence may be,” he said. A Scottish SPCA undercover inspector said: “Following a Scottish SPCA investigation, 105 animals were seized in the Aberdeenshire area. “The Scottish SPCA is a reporting agency to the Crown Office Procurator Fiscal Service and our inspectors are authorised to enforce The Animal Health and Welfare (Scotland) Act 2006. “Our investigations unit tackles a number of large scale investigations involving animal cruelty across Scotland.